DOWNLOAD: PNG | PDF | SVG | ODG (version 0.3.5.4). Note: The above should be considered a work in progress. Please help to improve it by commenting below. I will update it as new information becomes available. The Siddur is an aggregate of thousands of years of creatively inspired work. The organization of the material within any one particular siddur–the textual ingredients and arrangements –represents a specific lineage, or nusaḥ,plural, nusḥaot with its own history of development. There are a good number of different lineages some of which are still alive and changing, others which due to the circumstances of history are now quite obscure. Nevertheless, their voice might still whisper within the pages and tunes of more familiar traditions, if you know where to look. Lawrence A. Hoffman‘s Beyond the Text: A Holistic Approach to Liturgy (Indiana University Press, 1987) provides a flowchart illustrating the developmental history of some familiar liturgical lineages. 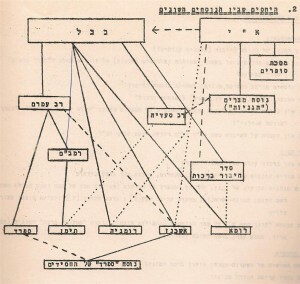 According to Dr. Richard Sarason (HUC-JIR), the chart is based on one prepared by Dr. Joseph Heinemann for his course on the history of the Siddur at Hebrew University in the mid-1960’s (see right). It appears in Heinemann’s Akadamon choveret, T’filot Yisra’el v’toldotehen: Leqet m’korot (Jerusalem: Hebrew University, 1966) and was copied pretty much verbatim by Jakob J. Petuchowski, Guide to the Prayerbook (Cincinnati: HUC-JIR, 1968) — which is probably where Hoffman discovered it. 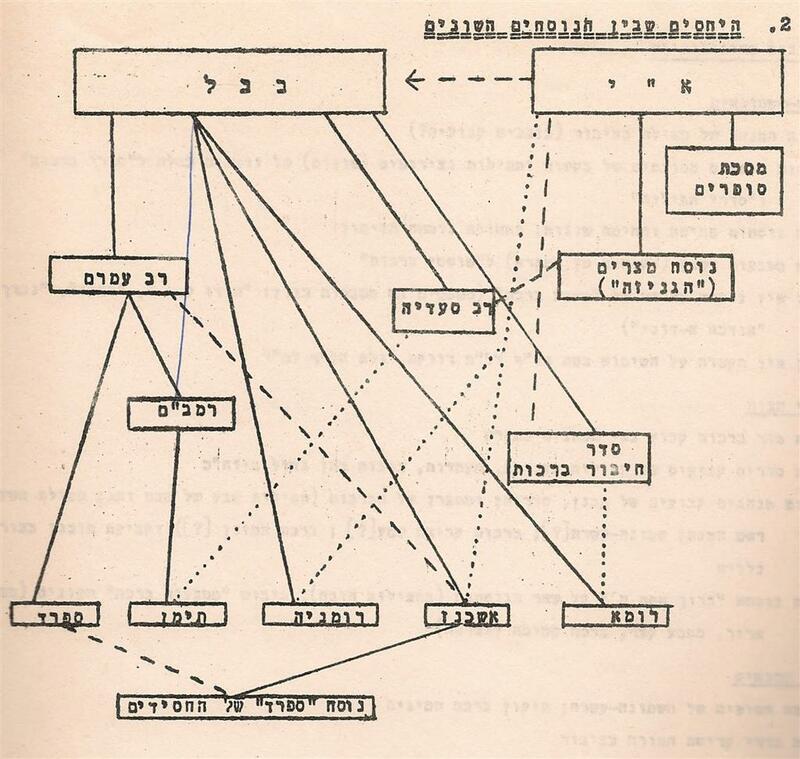 I was grateful to be introduced to the chart at Yeshivat Hadar where R’ Elie Kaunfer shared it in his class on T’fillah. In the chart one can see how the liturgy of Nusaḥ Ashkenaz largely depends on the “Babylonian Rite” with minor influences directly from the “Palestinian Rite.” Here, Babylonian refers to the nusaḥ seen in development in the Talmud Bavli (Babylonian Talmud) and Palestinian refers to the nusaḥ described in Tannaitic sources and the Talmud Yerushalmi. Maps showing the relationship between the nusḥaot are quite helpful to us. The Open Siddur Project is seeking to digitize all the extant nusḥaot witnessed in siddurim and other manuscripts, in order to show the evolution of individual prayers and blessings. This will helpfully represent at least the textual diversity of Jewish spiritual expression in the many geographically dispersed Jewish communities over the past three thousand years. I also hope that representing this diversity in t’fillah will be an inspiration to individuals engaging in davvening as an intellectually engaged and creative discourse speaking across generations. The extent to which we’ll be able to realize this vision will be limited to how many source texts we’ll be able to identify, transcribe, and share with open standards and free culture licenses. Seeing that the design of the map appearing in Hoffman’s book left much to be desired, I redesigned it for clarity while adding some additional nusḥaot. I hope that the following map based on Joseph Heinemann’s work will help inspire fellow researchers to contribute to this project. The map charts the development of Jewish liturgies over time and is color coded by period, the top of the map showing the earliest nusḥaot and the bottom of the page with the most recent variations. White represents Hebraic traditions before the Babylonian exile (pre-582 BCE). Yellow represents the period of the second temple (roughly 582 BCE to 72 CE). Orange, the Tannaitic and Amoraic period (72 CE to 500 CE). Green, the Geonic period (600 CE to 1000 CE) and light green the period of the Rishonim (1000 CE to 1400 CE). Light blue represents the period between the Spanish expulsion and the Sabbataean controversy (1492 CE to 1666 CE), and the dark blue represents the period of Ḥassidut and the Haskala up until the Holocaust (18th century until 1948). Some of the more recent formulations of these variations as adopted by Jewish communities and particular denominational movements are represented in violet. The nusḥaot found in Heinemann’s chart are shown in in outlined boxes. Added material is indicated as boxes without outlines. Nusḥaot of which I have scant information I have left without an outline or color. 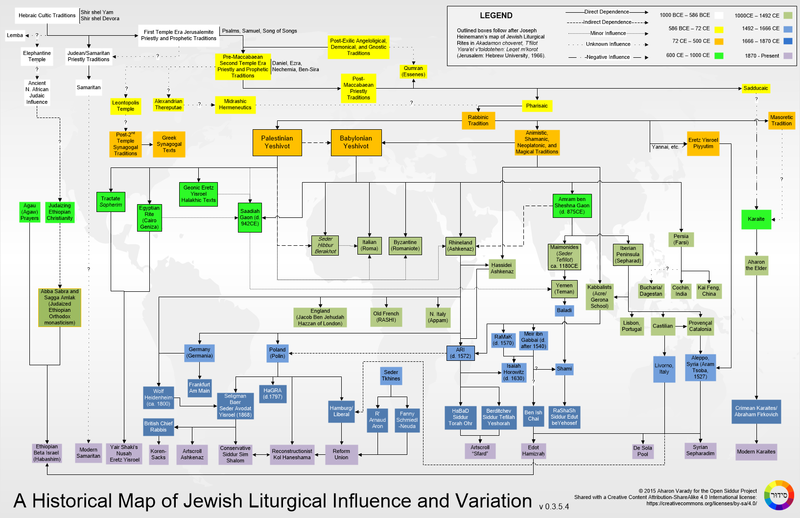 “נֻסְחָאוֹת | A Historical Map of Jewish Liturgical Influence and Variation” is shared by Aharon N. Varady with a Creative Commons Attribution-ShareAlike 4.0 International copyleft license. 2010-05-10 – 26 Iyyar 5770 at 12:59 am · Reply. For some clarity on Nusach HaAri, Dr. Sarason recommends reading Stefan Reif, Judaism and Hebrew Prayer: New Perspectives on Jewish Liturgical History (Cambridge, 1993), pp. 251-255. Unfortunately, the pages are not all available on Google books. I also need some help determining what exactly happened to the Iraqi nusaḥ with the Ben Ish Chai… what exactly is the history of the Edot Hamizrach? 2010-06-04 – 23 Sivan 5770 at 1:45 pm · Reply. 2010-08-03 – 23 Av 5770 at 2:11 am · Reply. Version 2.2 incorporates important information on the history of Ethiopian Jewish liturgy from Dr. Kay Shelemay, G. Gordon Watts Professor of Music and of African and African American Studies at Harvard University. Based on her research of the Beta Israel, (research supported by other scholars and most recently by Dr. Steven Kaplan at Hebrew University) the oldest sources of liturgy used by the community were derived “from Ethiopian Christian sources at relatively late dates (mainly post 15th century).” It’s impossible now not to wonder about Yemenite influence on a Judaizing community of Ethiopians who converted to Judaism at some point in the last millenium. My sincerest hope is that this finding reinforces the beautiful and strong connection that the Beta Israel have as fully part of the Jewish people and our common heritage. We are all born strangers, but are all united in our passion for Torah and our traditions. 2010-08-03 – 23 Av 5770 at 12:45 pm · Reply. Version 2.3 takes another look at Qumran and the Saducees. I’ve organized them both under Cohanite/Priestly traditions closely associated with the Temple and suspicious of folk/democratic/prophetic models being preserved by the Pharisaic tradition through drash. 2010-09-17 – 10 Tishri 5771 at 9:27 am · Reply. This is a fantastic chart. Kol ha kavod!!! What about going past the early 1960s- ie: where is the Renewal siddur? the newer Conservative and Reform siddurim? The non-official ones like Likrat Shabbat and the New Machzor? If you wanted to include it – the Kohenet siddur ? The newly published Hebrew atheist siddur? The older secular humanist siddurim in English? Dates of the various modern issues of New Union, Gates of Prayer, Harlow, Silverman etc. would be useful as well. I realize this may be beyond the scope of what you set out to do, but it would be great to have. (And if you decide to do it, I’d help). And I know that your source was from HUC, but I really don’t see a lot of evidence for Reconstrutionist liturgy coming from Reform, it was really developed from the Conservative movement by (at that time) Conservative rabbis. 2010-09-17 – 10 Tishri 5771 at 10:02 am · Reply. Expanding the chart to include individual siddurim rather than the nuchaot that they witness is outside the scope but I think it should be done. I’d love to map out the major influences and associations between nuschaot witnessed in 20th and 21st century siddurim. Eric Friedland is a great resource who can probably help us with this and I think a lot of people would like to see it too. Thanks for the feedback on Reconstructionist liturgies. There’s lines between both Reform and Conservative, and the line from Reconstructionist to Conservative has a double arrow indicating that the influence is going both ways now. The source for this chart and that information wasn’t HUC. So in the next version of the chart I’ll be careful to make the feedback I’ve received from several liturgy scholars more clear. It’s a techical hurdle, but if I could only create this chart with HTML 5 web elements then I could probably create inline footnotes. That would make the flowchart much more dynamic than a static image rendered offline using MS Visio (closed source, proprietary software). 2010-11-25 – 18 Kislev 5771 at 11:52 am · Reply. Where do you think Egyptian Karaites fall on the map? Also, I think early Reform was influenced by the German rite more than anything. Only in Mishkan Tefillah were there more overtures to the Polish rite. 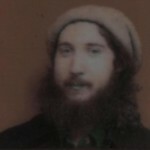 2010-11-25 – 18 Kislev 5771 at 1:59 pm · Reply. Actually, Dr. Sarason and Dr. Friedland emphasized that early Liberal (Reform) nuschaot were influenced locally by the nusach of their respective community. So for example in Hamburg, the Liberal nusach was derived from the Spanish-Portuguese tradition. Re: Egyptian Karaites, I would like to know more. We would certainly be interested in any digital edition of their liturgy. 2013-01-24 – 13 Shevat 5773 at 5:03 pm · Reply. 2013-01-24 – 13 Shevat 5773 at 5:05 pm · Reply. 2013-09-07 – 4 Tishri 5774 at 3:25 pm · Reply. I would like to see this map applied towards tracking shofar practices and teachings. Towards that end, I have reposted the map with a call for a scholar interested in undertaking the project. See http://hearingshofar.blogspot.com/2013/09/map-of-shofar-diversity.html/. 2014-02-10 – 10 Adar I 5774 at 12:23 pm · Reply. According to your Historical Map the Minchag Italia and Aschkenas descended from the Babylonian Rite. However, as far as I know, some claim that the Ashkenazi rite descended from the ancient rite of Eretz Yisrael? 2014-02-10 – 10 Adar I 5774 at 2:17 pm · Reply. 2014-09-07 – 13 Elul 5774 at 10:23 am · Reply. 2014-09-07 – 13 Elul 5774 at 10:39 am · Reply. It is in the chart above. Look under Ashkenaz. 2015-01-08 – 18 Tevet 5775 at 7:12 pm · Reply. The Lithuanian tradition of prayer from the school of the Vilna Gaon is another line to consider adding. Also Rav Goren put out a siddur which unified all existing nusachs. 2015-03-02 – 11 Adar 5775 at 9:44 am · Reply. What about the nusach used in the Maghreb (Algeria, Morroco, Tunisia) where they used the Tefilat Hachodesh siddur? 2015-03-02 – 11 Adar 5775 at 9:50 am · Reply. Can you say more? Is the Maghrebi nusaḥ one that survived the influx of refugees from the Spanish expulsion, or is it a Sepharadi nusaḥ that evolved independently since the 16th century? If it is a Sepharadi nusaḥ which branch of the Sepharadi family did it develop from: Lisbon, Castille, or Catalonia? 2015-03-02 – 11 Adar 5775 at 3:57 pm · Reply. tefilat hachodesh is standard livorno text. It was used not only by N.Africans but also by Turks and others, (Modern) SYrian text and others are based on it. In fact its probably the basis of pan-Sephardic siddur though the newer pan-Sephardic siddurim incorporate more oriental elements. 2015-03-03 – 12 Adar 5775 at 3:45 pm · Reply. Aharon, how is the chart doing on the Sefaradi side? Any obvious errors? How might you reorganize it? 2015-04-12 – 23 Nisan 5775 at 6:49 pm · Reply. I would add though that many N. African communities to this day have a nusah that more or less follows the basic outline of what the chart describes as “Livorno,” including in some part of N. Africa continuing with the longer version of Barukh She`Amar, using the alternate Shabbat Mussaf, and “de`ah bina vehaskel,” and the additions to birkat hamazon (which are less common among Syrians, though also found in Spanish/Portuguese communities) and “ki Kel Melekh Gadol veQadosh Atta” as well as various qabbalistic additions (which are commonly found in S&P rites). (See the various modern versions of Tefillat haHodesh or Siddur Patah Eliyahou, which are basically updates to the old siddurim that exclude some of the more esoteric elements.) So the Maghrebi minhag should at least have their own arrow from Livorno. Some Maghrebi communities also incorporate minhagim that are not strictly found in the Livorno siddurim as well. For example, there are also a few commonalities between the Maghrebi minhag and the Carpentras/Cavaillon/etc. minhag, such as “yahid” in the hatima of yishtabah, which might suggest some independent influence from what you list as the Provencal/Catalonian tradition on Maghrebi customs. One could almost says that there’s a cottage industry of N. Africans and Temani perpetuating their own versions of the Livorno rite. 2015-03-02 – 11 Adar 5775 at 11:31 am · Reply. 2015-03-02 – 11 Adar 5775 at 4:37 pm · Reply. Dos iz richtig! In fact Va’ani Tefilati includes alot of oriental options (long Kaddish etc) and sometimes emendations made from the Oriental/Sephardic Nusah to the main text, like for example maintaining the acrostic in “befi yesharim” or having “tefilas kol peh” in the shmone esrei In fact if it had given options of “ahavas olam” for morning and “Sim sholom” for night it would would be an altgemeiner siddur like “Nusach achid” or the farshidene ‘Sfard’ siddurim available. 2015-03-03 – 12 Adar 5775 at 3:43 pm · Reply. Thanks Shoshana. I’ve relabeled the box, “Conservative Sim Shalom” to avoid confusion. 2015-03-02 – 11 Adar 5775 at 5:17 pm · Reply. 2015-03-03 – 12 Adar 5775 at 3:14 pm · Reply. re: 1) Forgive me for not including more room for notes in this chart — the “Provençal” nusaḥ referred to is in reference to the siddur Rashi. re: 2) This chart is referring to the older nusaḥ anglia — the tradition that was witnessed in the “Etz Ḥayyim” of Jacob Ben Jehudah Ḥazzan of London. Certainly, the chart could be expanded and improved — right now I’m feeling like the amount of content is pushing past the 11×17″ dimensions allotted. Thank you for your comment. 2015-03-03 – 12 Adar 5775 at 9:17 pm · Reply. 2015-03-12 – 21 Adar 5775 at 9:36 am · Reply. Thanks Aharon. Stay tuned for the next version bump. Also, please feel invited to connect with us if you’d like to collaborate more closely on this. 2017-07-01 – 7 Tammuz 5777 at 12:14 am · Reply. Thank you for all your hard work! It is wonderful that someone is doing this. Yasher Koach!